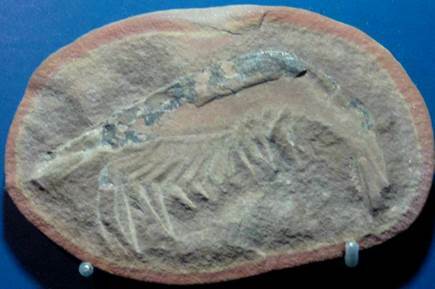 One of the most remarkable soft-bodied fossil deposits (lagerstätten) on Earth is the Pennsylvanian-aged Mazon Creek Lagerstätte near Chicago, Illinois. In the Mazon Creek area, the Francis Creek Shale consists of concretionary gray shales. The Francis Creek concretions are ironstone, and can be fossiliferous or unfossiliferous. The fossiliferous concretions contain land plants and terrestrial & marine animals, including nonmineralizing organisms. Essexella asherae Foster, 1979 (above & below) - fossil jellyfish in concretions (above: concretion is 6.5 cm tall; below: concretion is 7.1 cm tall) from the Mazon Creek Lagerstätte (Middle Pennsylvanian) of Illinois, USA. Jellyfish are extremely rare in the fossil record. This is hardly surprising, considering they completely lack hard parts, and the tissues they do possess are gelatinous. The most abundant marine organisms in the Mazon Creek biota are jellyfish. 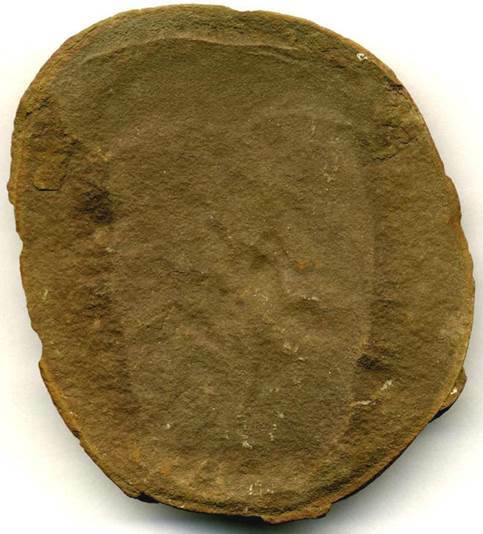 Many Mazon Creek jellyfish specimens do not have many diagnostic features, and are affectionately referred to as “blobs” by local fossil collectors (“blob A”, “blob B”, “blob with character”, etc.). 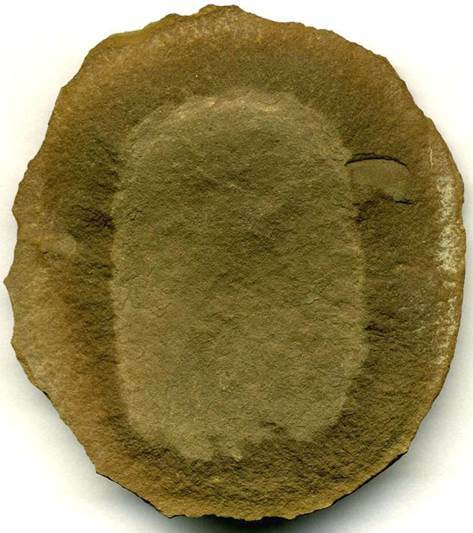 Essexella asherae jellyfish fossils consist of a bell and a relatively long skirt. Sometimes, well-defined tentacles extend below the level of the skirt (see specimen above). Generously donated by the Geology Department of the Field Museum of Natural History (Chicago, Illinois, USA). Whose grave I did not rob. So round and nicely split. I'd bend to pick up you. But alas, you're not so rare. I left you lying there. Anthracomedusa turnbulli Johnson & Richardson, 1968 - fossil jellyfish in concretion from the Mazon Creek Lagerstätte (Middle Pennsylvanian) of Illinois, USA (FMNH PE 38977, Field Museum of Natural History, Chicago, Illinois, USA). 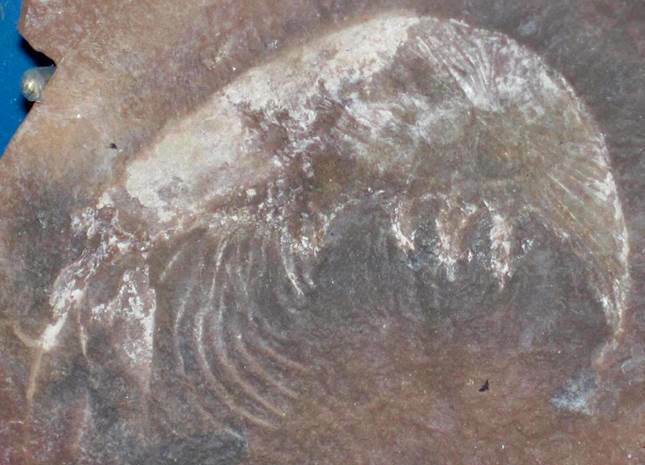 This is a rare example of a fossil cubozoan jellyfish. Cubozoans are also called “box jellyfish” for having a subquadrate bell shape. Some of the most venomous marine animals in modern oceans includes species of box jellyfish. This specimen has been compressed perpendicular to the oral-aboral axis of the jellyfish body. The central structure is the bell. Anthracomedusa had four tufts of tentacles near the periphery of the body - those are the irregularly linear structures near the margin of the concretion. Kallidecthes richardsoni Schram, 1969 - laterally compressed fossil shrimp in concretion from the Mazon Creek Lagerstätte (Middle Pennsylvanian) of Illinois, USA (FMNH PE 37598, Field Museum of Natural History, Chicago, Illinois, USA). Acanthotelson stimpsoni Meek & Worthen, 1865 - dorso-ventrally compressed fossil shrimp in concretion from the Mazon Creek Lagerstätte (Middle Pennsylvanian) of Illinois, USA (FMNH PE 37647, Field Museum of Natural History, Chicago, Illinois, USA). Belotelson magister Packard, 1886 - laterally compressed fossil shrimp in concretion from the Mazon Creek Lagerstätte (Middle Pennsylvanian) of Illinois, USA (FMNH PE 45648, Field Museum of Natural History, Chicago, Illinois, USA). Bandringa rayi Zangerl, 1969 - fossil shark in concretion (~10.7 cm across) from the Mazon Creek Lagerstätte (Middle Pennsylvanian) of Illinois, USA (FMNH PF 5686, Field Museum of Natural History, Chicago, Illinois, USA). This is the holotype specimen of a bizarre looking juvenile shark. It has an extremely elongated snout, well-preserved eyespots, and a set of very small teeth arranged in a V-pattern (discernible as two light-grayish lines extending in the 2-o’clock and 3:30 directions from the lower eyespot). This rare species has been reported from the Mazon Creek deposit of Illinois and from Cannelton, Pennsylvania, USA. Annularia stellata Wood, 1860 - fossil horsetail in concretion from the Mazon Creek Lagerstätte (Middle Pennsylvanian) of Illinois, USA (FMNH PP 29326, Field Museum of Natural History, Chicago, Illinois, USA). 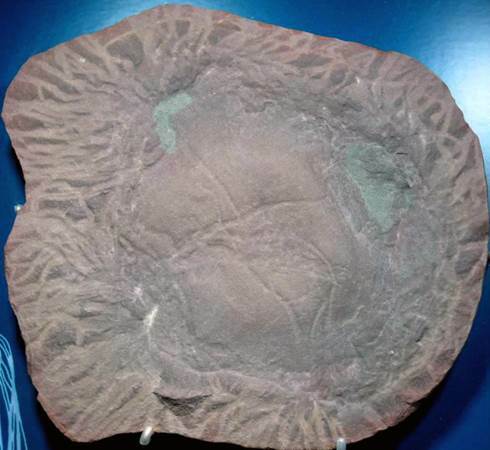 This is one of the most common Mazon Creek plant fossils. 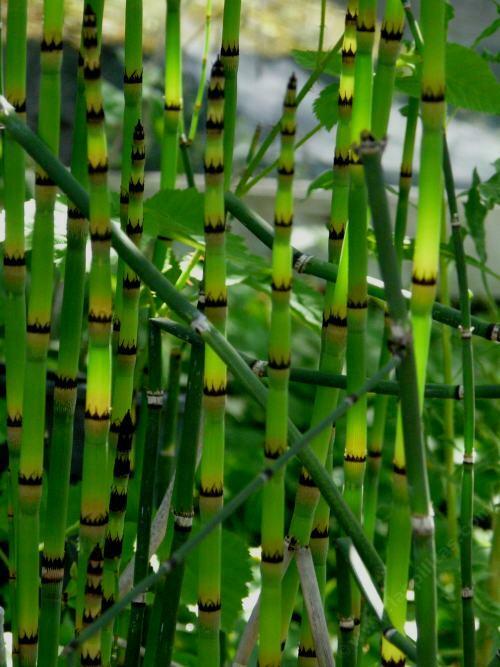 The horsetails are the sphenophytes, of which only one genus survives in the Holocene - Equisetum. 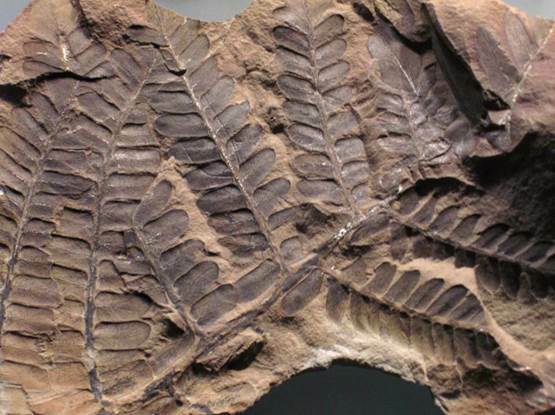 Annularia is an easily-recognizable foliage genus of fossil calamitacean sphenophyte. It consists of a central axis (stem) with whorls of elongated-spatulate leaves originating from widely-spaced nodes. Depending on the species, there may be from 5 to 32 leaves per whorl/per node. The leaf whorls of Annularia were probably not perpendicular to the upright axis/stem. Neuropteris flexuosa Sternberg, 1823 - fossil seed fern from the Mazon Creek Lagerstätte (Middle Pennsylvanian) of Illinois, USA (FMNH PF 46204, Field Museum of Natural History, Chicago, Illinois, USA). The seed ferns are not true ferns. They typically grew into trees (arborescent). Seed ferns were odd plants that had woody trunks, large fronds bearing fern-like foliage, and reproduced using seeds (not the spores of true ferns).